VSN is getting ready for the biggest Broadcast and Media show in Europe, IBC Show, celebrated in Amsterdam in September 2018. The company will bring a batch of innovations and new solutions, such as the latest version of its traffic and scheduling system for TV, radio and Web TV, VSNCrea, which will be officially presented at IBC 2018. “At IBC 2018 we will launch VSNCrea, an HTML5 and cloud-based version of our previous software VSNCreaTV for traffic and scheduling, and our VSNExplorer MAM media management platform integrated with the artificial intelligence systems of IBM Watson, Google Cloud, Microsoft Azure and Etiqmedia for automatic metadata detection. These new releases further underscore our ongoing commitment to supporting the worldwide media and entertainment industry through an increasingly sophisticated portfolio of cloud-based and innovative solutions.”— Patricia Corral, Marketing Director of VSN. VSNCrea is the company’s new software for TV, radio and second-screen traffic and scheduling. It enables the management of a company’s content production catalog, either owned or acquired from third parties, as well as its advertising, production workflows, programming and broadcast planning — all from a unique user interface. VSNCrea, which will be available for VSN clients in 2019, has been completely redesigned to offer broadcasters a brand-new, modern and user-friendly web interface that allows them to make quick and accurate decisions about when to broadcast a certain piece of content, thanks to its unified functionalities and workflows in one single interface. It also provides useful extra information such as analytical data about the actual profitability of the content. As it is HTML5-based, the software will be accessible anytime anywhere from any web browser and device by multiple users simultaneously. Also, the possibility of running this software in the cloud will enhance the ability of users and departments to work together on a more collaborative basis. The system can be used specifically within TV channels, radio stations or web TV platforms for traffic and scheduling, programming planning, advertising management and control of third-party TV rights acquired for broadcast, among others. Other features include the ability to change language within the user interface, the consolidation of the final broadcast and the analysis of the programming and content return on investment (ROI) through analytical reports. VSNExplorer Media Asset Management (MAM) software has been integrated via API with the Artificial Intelligence (AI) systems of IBM Watson, Google Cloud, Microsoft Azure and Etiqmedia for automatic metadata detection. The integration of VSNExplorer MAM with these tools ensures that media management becomes more efficient, accurate and easy to use, allowing a greater control of all content, either available in storage or being ingested, and reducing the time and costs necessary to obtain higher quality content. These new capabilities allow the automatic detection of metadata directly from the media, which can be accessed from VSNExplorer MAM cataloging view. Metadata can relate to file characteristics, such as format, size or date of creation, but also to its content, cataloguing media files and each of its segments according to the information captured from the video (image processing, object detection and contextual information), audio layer (speech-to-text, text transcription and translation, or audio effects detection), actions performed, its main sentiment (positive, negative or neutral) and even the people appearing in the content (face recognition). 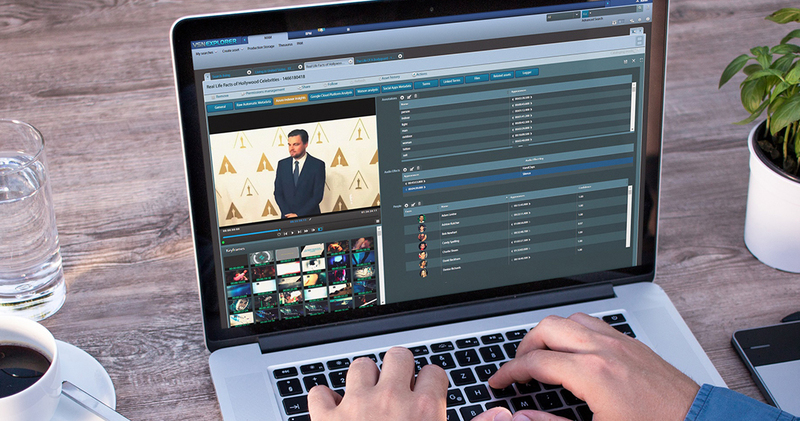 VSN News Production solution places a special focus on easing the user’s workload and allowing them to be more creative, rather than focusing on the ‘story’ behind the news. Following the implementation of three VSN systems (VSNExplorer MAM with Wedit, the studio automation VSNLivecom and VSNExplorer plugin for NRCS, a MOS Media Bus that is fully developed in HTML5), the Inbound News Production solution provides users with a single workspace to prepare their news, walking them through the entire news production process, from ingest to broadcast, without switching windows. It enables journalists to quickly search for content through the MAM system, edit video files, unify them with graphics and send the final news piece to broadcast — all within the journalists’ NRCS GUI. Show attendees interested in discovering more our products and solutions can visit VSN’s booth (7.B19) at IBC Show, which runs from 14 – 18 September 2018 in Amsterdam, or even book a demo in advance through VSN’s website.